I’m thinking a lot about pretexts nowadays. In the U.S., when people demand to know where you are from, what they mean is that you couldn’t possibly belong here because of your skin-color or accent. When people inquire as to how your family took your coming out as gay, they are harboring false assumptions about how brown people deal with queerness. Pretext happens when you get pulled over for your skin-color but get charged with “driving without a license” and face deportation. Heck–not having papers is a pretext. The land of the free and home of the brave is full of these sorts of pretexts, and life here is about learning and navigating them. 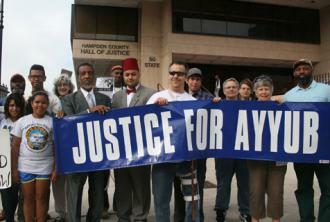 So Justice for Ayyub is a campaign to free a man, Ayyubb, from the prison-industrial complex who got caught up in it due to pretexts. Ayyub–a Muslim man and the son of a Black Panther–was targeted by the FBI to become an informant, and when he refused to serve as a snitch, the FBI reportedly fabricated a weapons charge against Ayyub, offering him exoneration only if he became an informant to spy on the Muslim community. The ongoing trial is a pretext–what the FBI really wants from Ayyub is his cooperation. Another pretext-the White House arranged a news leak this week that more executive action is coming, but leaked the news in advance to gauge the reaction of both immigrant rights groups and rabid right wingers. The response: quite underwhelming from the left as the changes appear to be hollow, and a nasty letter from the GOP. Message the White House gained from this: If you can’t make either side happy, perhaps you are doing the right thing. Meanwhile, the hunger strikes at the White House continue, with a Congressional briefing on May Day next week featuring Not One More Blue Ribbon Commission members on how the President can act to stop deportations. The other pretext, of course, is suggestions by advocates that acting to stop deportations would kill any chances of the long-dead CIR. We used to hear the same thing when pushing for a standalone DREAM Act, and then DACA. Real reason for inaction: Lack of political will. The Department of Homeland Security (DHS) is just a pretext for thug life. There’s nothing else I want to say about this rogue and miserable agency. Arguments against affirmative action nowadays use Asian-Americans as pretexts telling us that if we don’t rise up against the use of race in college admissions, we are doomed as affirmative action hurts Asian-Americans. The real reason for opposing affirmative action is the maintenance of white privilege, and white supremacy. Plain and simple. What’s not a pretext is that I’m signing off now because an island awaits me for the next month. It isn’t paradise, but it comes close. Hasta la vista!